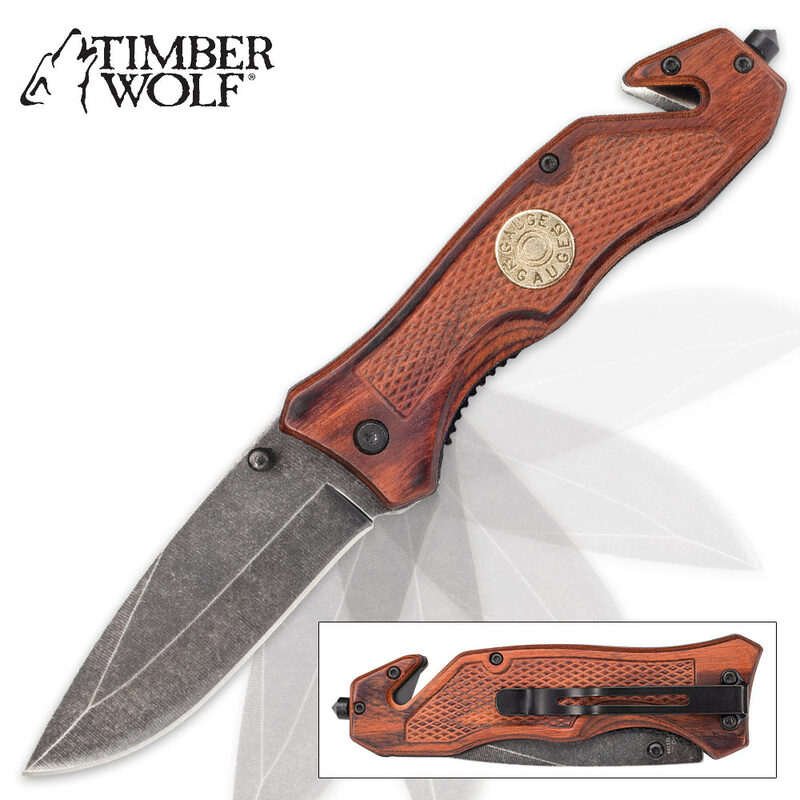 Timber Wolf 12 Gauge Shell Assisted Opening Pocket Knife | BUDK.com - Knives & Swords At The Lowest Prices! If you love shotguns and you love knives, you can't go wrong with the Timber Wolf 12 Gauge Shell Pocket Knife! 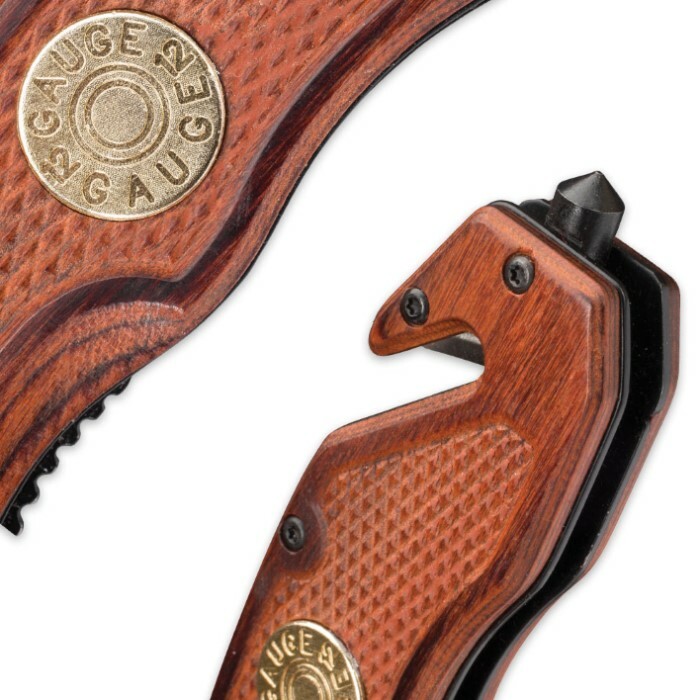 Adding a bit of firearm flavor to this cool assisted opening folder, a brass shotgun shell head is carefully inlaid into the knife's handsome gun stock-textured wooden handle. The mirror polished brass of the shell head beautifully offsets the natural grain and brown, amber and burnt umber hues of the handle wood. This razor sharp beauty's not all looks, however. The 12 Gauge Shell Pocket Knife boasts a stout 3 3/4" stainless steel drop point blade with a rustic stonewashed finish. With a gentle nudge of the handy thumb stud, the blade flies open at an impressive speed, thanks to the advanced assisted opening mechanism. At 5" closed, this rugged folder fits easily in jeans pockets, especially with the integrated pocket clip. Well suited to practically any day-to-day cutting job, this versatile folder is a perfect everyday pocket knife. It's also great for emergencies with the included seat belt cutter and glass breaker. 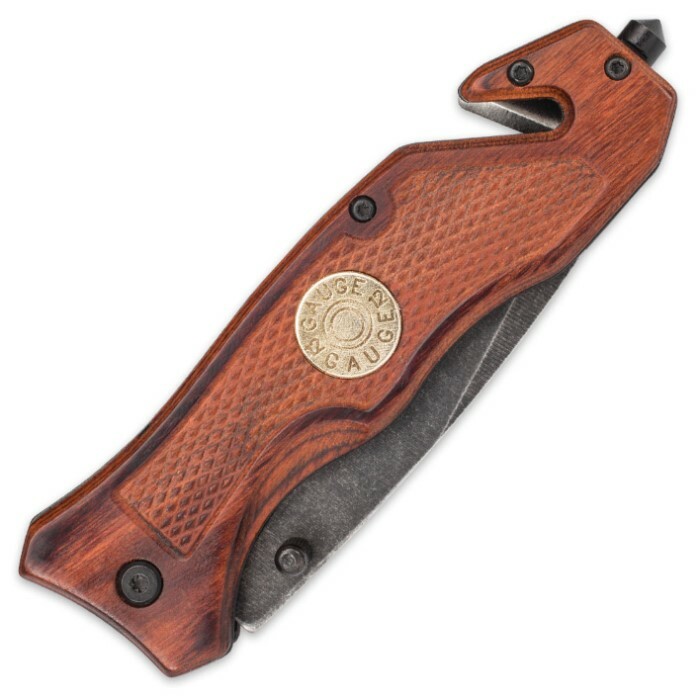 The 12 Gauge Shell Pocket Knife makes a great gift, especially for hunters, and at this price it's painless to get two - one to gift, one to keep! Lightweight and very well made. Its a beautiful knife. Great gift! Ive carried one of these for about a month it is a heavy-duty knife I really enjoy.